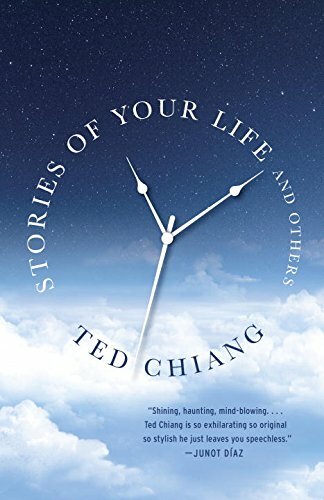 The first short story collection from multiple award-winning science fiction writer Ted Chiang. In Chiang's hands, SF really is the 'literature of ideas' it is often held to be, and the genre's traditional 'sense of wonder' is paramount. But though one reads Stories of Your Life with a kind of thematic nostalgia for classic philosophical SF such as that of Asimov and Theodore Sturgeon, the collection never feels dated ... the collection is united by a humane intelligence that speaks very directly to the reader, and makes us experience each story with immediacy and Chiang's calm passion ... all his stories unfold with a logic that is ineluctable and compassionate. I think Chiang is one of the great science fiction short story writers of all time ... I generally try not to simply burble incoherently that things are brilliant and you have to read them, but faced with stories this awesome, that’s pretty much all I can do. The amount of research and concentration each one must have taken surely would have caused multiple head explosions in lesser writers. But Ted, he’s at the top of his class. He’s the King on the Hill, screaming alien math equations into the stars ... There are many other stories in this collection, all of them good in their own ways, but the absolute winner is 'Story of Your Life.' I possess no hyperbole when I tell you this might be one of the best short stories I’ve ever read—or ever will. What did you think of Stories of Your Life and Others?